Directions: Follow US-380 into the city of Roswell, then turn right at N Main Street. The UFO Museum is located on the right side of the street. The visitor can park either along the curve or in the parking lot around the corner. 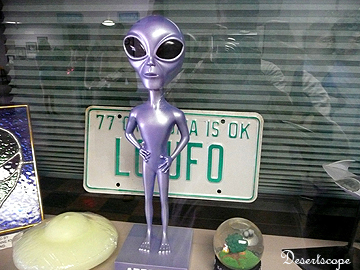 Opened in fall of 1992, the Roswell UFO Museum was funded by Roswell Realtor Max Littell and the former Roswell incident participants Lt. Walter Haunt and Glenn Dennis. Since then, people from all over the world has visited the museum. 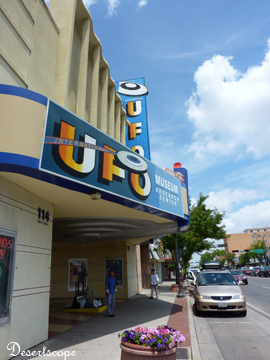 Each year, the city hosts its UFO Convention that attracts thousands of visitors to the area. The first portion of the wall were numerous photographs, news clips, letters, and some artifacts (even including a replica of the strange metal that was founded on the site) from the Roswell incident. In the center of the museum was a large stage with some of the UFO paintings on display. 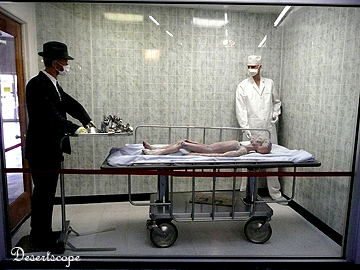 The other side of the wall are sightings and other stories about UFO, crop circles, a replica of the ancient Mayan carving, the photos from Hobos and a model depiction of the famous alien autopsy scene. Overall, the museum was better presented and professionally maintained than I had expected. No matter if you are a UFO fun or not, you can always enjoy reading about a piece of American history there.